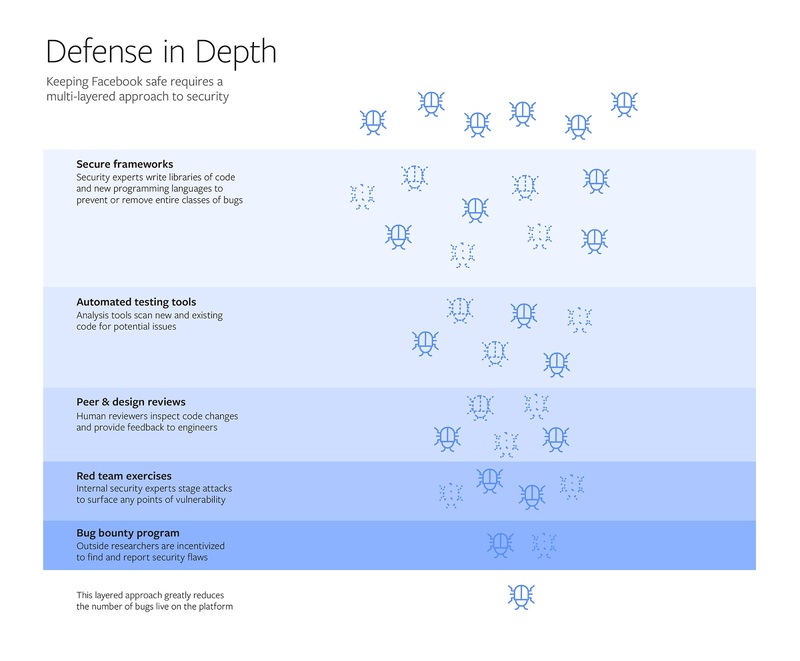 Facebook refers to the strategy that it uses in order to secure the various aspects of its platform as the “defense in depth” approach. Basically, their security strategies involve a multilayer approach, one that incorporates a step by step check to make sure that all of the various aspects of the social media platform are running smoothly and that there is no serious problem that needs to be patched up especially when the platform is attempting to deploy some kind of new feature or updated software. As for the layered approach, there are five basic layers to Facebook’s security protocols. The first layer of security involves securing the various frameworks that allow Facebook to function at its present capacity. This involves creating new code that can wipe out bugs before they have a chance to do any real damage. The second layer involves the use of testing tools that consistently check for vulnerabilities that could potentially end up causing any kind of loss of data or other security breaches such as the many that occurred over the course of the previous year. Another layer of defense involves human coders that check changes before they are implemented. This is heartening to see because of the fact that we often see security handed off to algorithms and the like in spite of the fact that we need human beings to make sure that the code is up to speed. The fourth layer involves test attacks that will check the security systems and make sure that they do not end up having any leaks that need to be patched up. The final layer involves outside help. This is called the Bug Bounty Program and involves users being given incentives to report bugs that occur. "Supporting our global community is a great responsibility that has driven continuous improvement and investment in our security technology and talent. Our focus on finding, fixing and preventing security issues has allowed us to scale our defenses as Facebook has grown to support billions of people connecting with one another. ", announced Collin Greene, Facebook's Manager of Product Security. Adding further, "At times this has meant adapting our strategies to protect our expanding global community, rewriting our widely-used coding frameworks and open-sourcing unique security tools. And because we know that security work is never 100% finished, our security team will continue to innovate as the Facebook community grows."